The Irish Book Awards were held last night in Dublin and the last Artemis Fowl book beat out KOTW to emerge triumphant, giving Eoin Colfer a much deserved win. He went on the make the funniest speech of the evening while wearing the most dashing cravat I've ever seen on a real life person. Big congratulations to Eoin. 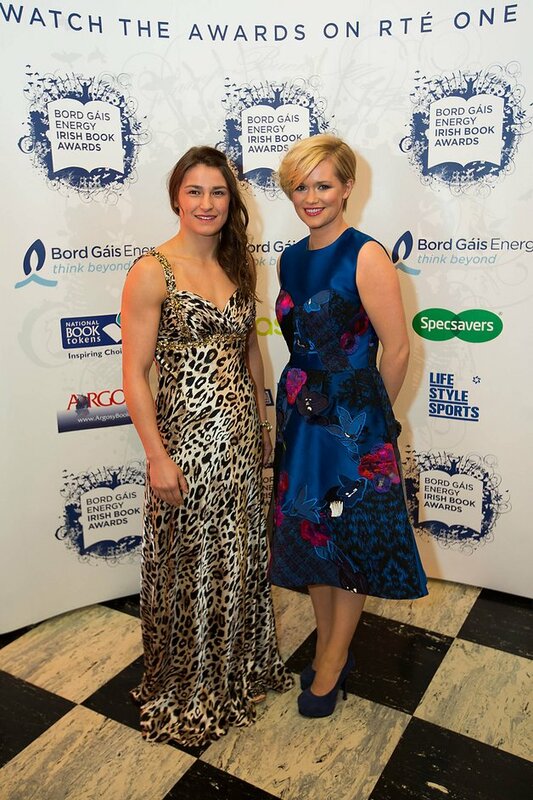 A few other people also won for, like, other categories- including Katie Taylor in the Best Sports Book. I really really really wanted to meet her and she was RIGHT THERE in front of me but then I was called away for a photo, and then there were a few people who wanted napkins signed, and when I looked around again she was gone. Dammit. I always thought she looked so petite on screen, but in person she is physically IMPRESSIVE. 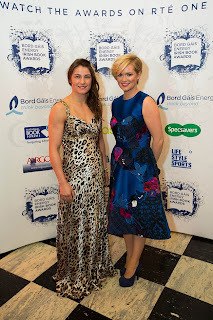 Here she is with Cecelia Ahern- one of my top two favourite writer-type-people that I know. My editor Nick came over for it, so we were chatting about the Tanith novella and he reckons it needs only the barest of edits. What does that mean for you guys? It basically means it'll stay at around the 54,000 word mark and I won't have to cut anything out. Apart from, apparently, all those mentions of Tanith in a bikini. I sincerely don't see the problem. It's not like I have her running around nekkid or anything. HOLY CRAP I GOT FIRST ON A BLOG POST HI DEREK!!!! Dang it I wanted to be first! Questions: First, did Skulduggery have a take name before he became a skeleton? Because I know that it is a word that suits him perfectly, but some people(like Fletcher in TFO) seem to take it a reference to his skeleton-nees. Second, if someone were an Elemental after the Surge, could they get the kind of symbols China had on their body and actually use them? Third, if the Necromancers had told Lord Vile what the Passage was, would he have done it? Fourth, does Mr. Bliss have a first name? Of course Derek did. He's Derek. How come the often-nekkid Valkyrie is not a problem and Tanith in a bikini would be? Um. Yeah. Congratulations on, um, not winning! I've only made my way through the first two Artemis Fowl books so far, so I've got no idea if the final book was any good, but I do know it's a very popular and well-loved series and the final book of such has probably more than earned its fan votes. Derek, come talk to us! Wait, what? Dexter Vex in a bikini? Whether or not you missed him isn't really the point of him posting a blog post. Kestrel - if there is Dexter Vex in that novella, and if there are situations requiring bikini wearage, it follows logically that we shall also get Dexter Vex in a bikini, yes? I can't really argue with that, I suppose. Hello Kribu! I'm Kilandra! Nice To meet you. I don't like Apple Cider. That's what I told her. She didn't want to be one. Well, I'm sure there are many branches of magic not in the books that lay untapped. Zaf, how are bikini-wearing abilities and family-raising abilities connected? I mean, yeah, maybe she wouldn't do the family thing very well (especially in her current Remnanted form), but just because she's fit and could wear a bikini well doesn't necessarily mean that she lacks brains or skills for other things. I just wondered what she meant by it and as you were the one posting it, I thought you might have had some idea. Derek you are adorable. x3 And I'm glad you had fun! Wbd - I'm at the swimming pool sitting at the side whilst my brother and sister have swimming lessons (I SAY THIS EVERY WEEK YOU MUST BE USED TO IT BY NOW). I gotta say this nightmare! Ok so I had this nightmare last night scared me to death. I'd prefer it if there were lots of both Aussiminions AND Ameriminions, rather than the Aussiminions dying out before the Ameriminions started flourishing. OMG THE TANITH NOVELLA IS GETTING CLOSER EVERYDAY!! I am seriously getting so so excited for it!! Now I can't wait to see the cover!! There's really bad signal here today . . . I'm still annoyzigged at him, plus The Last Guardian was his worst book and KOTW was one of Derek's best. KOTW was the better book of the two. DEREK SHOULD HAVE WON. I was just readin the post, looking at the picture, remembering last year, and BAM! Tanith in a bikini. That caught me off guard. ARTEMIS FOWL IS /NOT/ STUPID! IT'S AMAZING! "What people most want is what they can never, ever have." If you can't have something, you want it a lot more than if you can have it. Derek do you miss a line for each line in your book? Im good how are you? Well, Brad, there is Zaf, but she appears to be running around in circles. 1. Never. Derek will sit on his spinney chair watching us suffer without it, grinning evily. 2. The font is called: Golden God. 3. No, because Derek wants us to suffer and die and die again and suffer a bit more and then die and he will look upon us grinning evilly and laughing manically. Was in an annimation of cheese? It should of been. Cheese is great. In the car, my bro and sis, who had a packet of sweets each, were randomly being really nice and giving me a sweet or two each. Which was really nice of them. :) BUT MY BROTHER HAD SKITTLES. LOL. HE GAVE ME THREE SKITTLES AND I WAS JUST SITTING THERE LAUGHING. Then ny sister said, "Why are you laughing?" And I was like, :/ "Um, it doesn't matter." And she was like, "You have to tell me! I gave you a wine gum!" Staaaaaaaaaaar!!!!! *violently tacklehuggles* I apologise, if any bones are broken, now. So, Star, could you taste the rainbow? I've been here an hour. But I disappeared for quite a while in the middle of it coz we were driving home. HI ANYONE ELSE WHO ARRIVED IN MY ABSENCE! *Raises eyebrows* Which bit was lol? Excellent, Chloe. I'm pretty sure we only go to the chippie on holiday. Agh, I want to be able to raise one stupid eyebrow and I can't and it's NOT FAIR! @Ieni: *is lolling* Um . . . ANSWERS NUMBER THREE, MOSTLYYYYY. BUT ANSWER ONE AND TWO WERE FUNNY AS WELL. I can sort of raise one eyebrow ish. I'm writing all hyper for some reason. Why am I doing that? I think it's the music. Yep, it is. The music is hyper drugging me. So last night my brother was laughing hysterically and he fell over so I got out the red oven mitt and pretended to be Serpine. Every time I pointed at him he laughed some more, so it totally worked. The fish and chip shop in the next village does really nice fish and chips. Im totally gonna get all my christmas presents from here! Derek, I've got questions for you! 1. What's your favourite episode of Doctor Who? 2. Is it weird to you that I own a Derek-lizard? 3. Have you gotten my letter yet? It had lots of drawings and stuff in it. I sent it in DECEMBER. 4. Have you decided if I can be your best friend yet? Pleeeeeeeeeeeease? 5. Did Gordon have crazy fan girls when he was alive? 7. Do I scare you yet? 8. Can I be an assassin for the Munchkin Army? 10. What's your favourite colour (I have to ask...)? 11. What's the best thing a fan has done for you? 12. Can you mention Ivy Animosity in one of the books? Pleeeease? Just mention her or something? 13. Do you stalk the comments? 14. Are you sure you didn't pursue your plan to be a ninja? Melica, the giant Disney princesses are the most terrifying thing ever. I'M GOING TO GO SEE WRECK-IT RALPH TODAY!!! I love movies that are meant for little kids. I JUST WENT TO MAKE MYSELF BEANS ON TOAST AND BEFORE I WENT I BALANCED MY PHONE ON MY SISTER'S HEAD AND TOLD HER BOT TO MOVE. WHEN I CAME BACK WITH MY BEANS ON TOAST IT WAS STILL BALANCED ON HER HEAD. WOW. Your sister is good at balancing, Star. Zaf- well done for first post! erm.. yayy! And as for your mon's message.... wow. Okay, she'd officially as weird as you are. Kestrel- Skulduggery took the name BEFORE he became a skeleton. Ironic, eh? He took it because it was a word he used to describe the criminal goings-on that he investigated- years before it came into common usage. China's type of tattoos would not work on any other magical discipline. They'd work if drawn on a surface, but not on the body. As for your third question- who knows...? And for question 4, Bliss' first name is Mister. Kribu- It's double standards at work here, it really is. It may have something to do with the fact that every time Val is nekkid it's used as a source of amusement...! Oh, and Dexter Vex will NOT be in a bikini! The novella is out in, um... March? I think? I used Time Roman when I write, dunno what font it's published in, though. Book 9 will have an ending. Whether it's happy or not, I can't say! And now I'm going out! Woop! I always wonder why we say goodbye to a person who has already left. I mean, it's not like they're reading the goodbye-they've already left. NO DEREK STAY HERE WITH US WE WANT TO BOMBARD YOU WITH QUESTIONS!!!! I get up for 4 minutes to get a cup of water and when I get back it turns out that I MISSED DEREK?!? DEREK WE WANT TO STALK YOUR COMMENTS! Derek, read this and tell me your reaction. Msd, less than 1% battery remaining. Uh, 100% left because my computer is plugged in. Do any of you peoples have an Instagram? Happy 49th anniversary of Doctor Who! 49 YEARS AGO, DR WHO WAS BORN!! Im currently dying of laughter here. Aaah strange things. See Derek, my mom and I are very much a like. Bye guys. It's lunch time. only 365 till the 50th anniversary! I like 49th anniversaries better than 50th ones. This is odd. I'm almost six pm here. I'm going to rockclimbimg soon. hands up who likes american idiot !!!!! put your hands up if you like the inbetweeners! does anyone watch imma celeb? OHH I DO I DO !